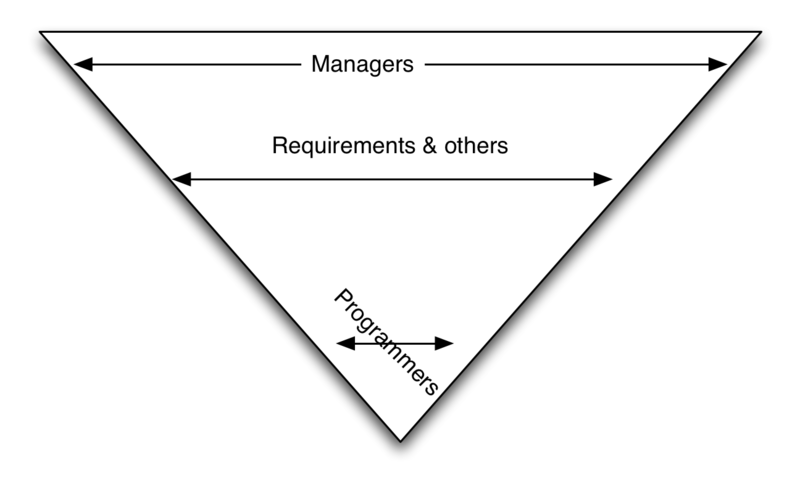 I’ve been meaning to write about the managers and Agile software development for a long time. And, apart from a few asides, I haven’t. Well partly because the topic is difficult, or rather large, but mostly I’ve not written it because I’m fearful of the flames that will come down on me. You see I think managers have a role to play in Agile, but I am acutely aware that many people don’t. So am I steeling myself, I’d love to come up with a “grand theory of management” but I’ve been trying to do that for years! I think instead I’d start blogging about my thoughts on management, and hopefully a grand unified theory of management will emerge. Still, I expect many people will not agree with me - there is one of them I can see right now, he’s almost standing in front of me. The funny thing is, I was a professional programmer, I got interested in management as a way of ensuring I didn’t become the type of poor manager I’d worked for. I took time out of my programming career to study management. What nobody told me was that if you study management programmers are more suspicious of you than ever, non-developer management types will always see you as a programmer (perhaps a jumped up programmer) and programmers who have fallen into management (those with no qualification and probably no time to study the subject) don’t trust you. Add in the fact that the academic community is split over management qualifications and it’s a right mess. Unfortunately managers and programmer are locked in a decades old existential fight. Many on the management side of IT dream of a world where programmers can be replaced by a software tool. That isn’t going to happen, all it does it move the point at which the programming happens. If you replace a programmer with a software tool the person who uses the tool is now a programmer - whether you call them a programmer, analyst, consultant or serf. The state of management in the IT world is so bad that frequently removing the manager altogether makes things a better than they were. Oh, and the misuse of the word “manager” doesn’t help. 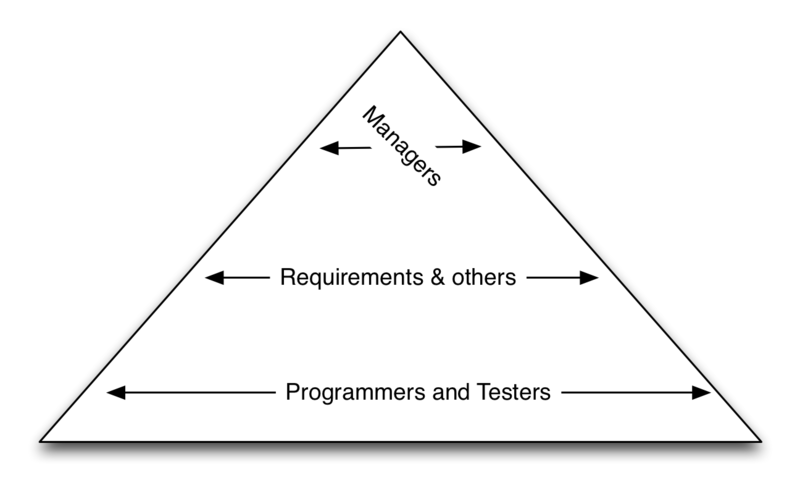 I’m an ex-programmer, I still consider myself an engineer (another controversy) and I also think management can play a useful role in engineering software development. It took me 10 years to become a software engineer and I never stopped learning, 34 years later I’m still learning to be a better programmer. I also hold an MBA degree, it took me a year of hard work to get it. 1 year, not 10 years and certainly not 34 years. Actually, it has taken three generations to make me an engineer: my farther was an engineer, and my grandfather too. I was going down engine rooms when I was 7 or 8, I’ve watched engines being overhauled. I know what being in dry dock means and I know commercial considerations and engineering considerations are often in conflict, but engineers not people in suits make it work. Being an engineer and a manager is not a contradiction. I know that because my farther and grandfather were Chief Engineers: they took years to obtain that rank, and when they did they still went down the engine room, they still mucked in sometimes, but they also spent a lot of time “managing” the work in the engine room and on deck. You see: it takes an engineer to manage engineering. I did notice that a few of the other replies recommended teams start with coaching rather than training. I’ve done it that way, in fact thats how all the early teams did it. I’ll also say that in my experience - and yes, I’m biased, I sell training - giving people some training up front works best. Perhaps thats because the way I do training is to give people a chance to experience working in an Agile setting in the classroom, so perhaps what I’m saying is: all training is not equal. This little recipe takes you so far. I’ve stopped with the technical stuff. The process side will get you so far but if you don’t do the technical stuff - lots of automated testing! - then you will only go so far. The other thing I haven’t said here at all is: this recipe is only for the supply side, once the supply side starts to shape up the focus needs to shift to the demand side, those people you call Product Owner, Business Analyst, Product Manager or something like that. Thats where it gets difficult, not because these people are themselves more difficult but because you are now wrestling with the wider organization and changing a bigger mindset. Another problem that sets in here is that companies can loose the will to change. I’ve worked with a few companies who apply this prescription but they get so much improvement the immediate pain goes away and they loose the motivation to change further. This prescription can very quickly makes things get better. But if you want the full benefit you need to keep taking the technical medicine and supplement it with demand side medicine too. Those changes take longer to make a improvement, they are a slow burn. Just a note to say my latest ramblings “From diseconomies to economies of scale” were blasted out to newsletter subscribers yesterday. If you are not on the newsletter list you can read a copy on the Software Strategy website - or better still subscribe to the newsletter and you’ll be among the first to hear. Right now my writing energies are going into the newsletter, Little Book of Requirements and User Stories and 50 Shades of Scrum, so this blog will be quiet for a little while yet. Sorry.